The spectacular underwater world of the Piccaninnie Ponds is another one of South Australia’s mysterious natural phenomenon. 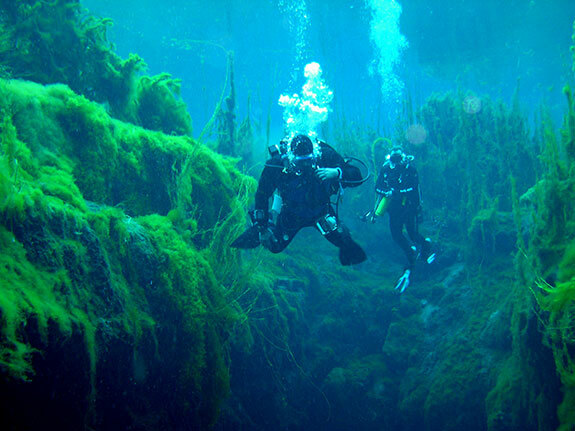 Recognised as a wetland reserve of international importance, it’s also a popular destination for the relatively unbeknownst activity of underwater cave diving. As crystal clear filtered freshwater rises to the surface under pressure, the limestone beneath the glassy tranquil surface of the ponds has been eroded into a fascinating labyrinthine underwater cave system. Part of this process has formed the incredible underwater cavern known as The Cathedral – majestic white walls of sculpted and scalloped limestone. Diving experiences of all kinds are available at the Lower South East Marine Park. The Fish Pond is around 10m deep, the shallowest of the diving experiences and perfect for diving or snorkelling into the aquatic world beneath the surface where abundant life thrives. The Cathedral is around 35m deep and well worth a dive for those brave enough! The Chasm is a sinkhole over 100m deep explored by the most adventurous underwater cavers. For those wanting to stay dry, you can also take a walk along the beach and see the freshwater springs bubbling up onto the sand from beneath the earth’s surface. You could also take hte walking trail through the coastal wattle and beard heath, providing fantastic views across the southern ocean and the marine park. Boardwalks then lead you into silky tea-tree and cutting grass plains where a lookout will greet you with incredible views of the wetland.